Some 41 places across England that were at the centre of suffragette action – from mass meetings and smashed windows to prison hunger strikes and post box fires – have been officially recognised within England’s national listings, while the grave of Emmeline Pankhurst, leader of the suffragettes, has been upgraded to II*. The grave of Emmeline Pankhurst, leader of the suffragettes, has been upgraded to II* today (8 June) by the Department for Digital, Culture, Media and Sport on the advice of Historic England. 41 other places across the country, which witnessed acts of protest by the suffragettes, have also been relisted. 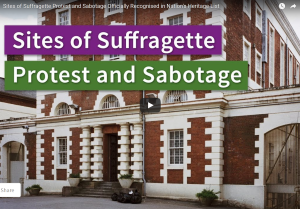 These places are already listed buildings but until now there has been no record of their suffragette history on the National Heritage List for England. 100 years on from the first women in the country being granted the right to vote, women’s history is still under-represented in national records. Through its HerStories project, Historic England has been working with researchers from the University of Lincoln to address this imbalance and officially recognise suffragette stories that are told in bricks and mortar on The List. The suffragettes were predominantly members of the radical Women’s Social and Political Union (WSPU), set up by Emmeline Pankhurst in 1903. They followed a different course of action to the suffragists, led by Millicent Fawcett, who lobbied MPs peacefully for women’s right to the vote. The suffragettes’ motto was ‘deeds not words’ and to fight for the vote they waged campaigns of sabotage and destruction on public property across the country.